One week closer to my marathon! Can’t believe how quickly these weeks are flying by. Guess that means I’m having fun?? Evening four mile run with Kyle. We ran at an easy pace except for an all out lap around a track halfway through the run. He wanted to see how much faster he was than me. Little did he know I’ve been getting faster… But it’s so fun to run together. Started the day with four miles. Kept my pace easy. Then took a 45 minute Flywheel class after work. My legs were heavy, but I still enjoyed the class. 1000+ calories burned for the day! It’s the year of fast after all. These weekly speed workouts are so necessary! (No matter how much I psych myself out about them). I always am impressed when I check my paces afterwards. A much needed rest day. Having my rest day the day after speed workouts is a wonderful thing. Early morning 8 miler in my hometown. It was nice to have a chance of scenery. Kept my pace easy! This long run was mentally tough. At least it wasn’t as hot as last week, but I had to run a lot of laps. I was out of town and in the corn fields which wasn’t really a safe place to run, so I went to a park with a two mile loop and did my long run there. Nearly nine laps around. Solo. I was bored, but at least I had never run there before. I listened to a couple podcasts and then switched to music when I switched directions. My legs were sore, but otherwise I felt really good. No real pain. No cardio tiredness. I’m really proud of myself for getting this run done. Heading out for a 17 miler alone on girls weekend when almost everyone else was still sleeping was tough. But I knew I had to get it done, so I did. And it’s pretty cool to have 17 miles not feel that far. I haven’t decided exactly what I’m going to do tonight, but definitely something easy since it will be late by the time I get home. Maybe 20 minutes of biking and some weights! Another week without a skipped workout or run. I’m being much more diligent this time around, and I’m hoping it will pay off. 10 more weeks left to put in the work! Another training week comes to an end. One week closer to my goal marathon. Week seven was a good one. My highest mileage week of this training cycle yet and I hit all of my goals. Feeling good! Morning run on heavy legs. It was to be expected after a great race, but the recovery miles were good for me! Started the day with another slow four miles. Legs were still super heavy, but I was glad I got the run portion of the day done early. These double workout Tuesdays can be tough. I definitely struggled through my evening circuit class, but still glad I did it. At least this class had more of an arm focus than a leg focus. Holy hot speed workout. This was tough. Workout was a Fartlek. It was a struggle to get through, but we crushed it. 9.13 miles total. 1:14:55. 8:12 pace overall. I know these speed workouts are only making me stronger…as tough as they might be. Proud of our effort! A much needed rest day. My legs were dying! Early morning 7 miler along the lake. 8:40 average pace. I was running on less than four hours of sleep, but I didn’t want to skip my run. It was already a hot one, so I was glad I got it done early. Toughest long run of training yet. 90 degrees with a real feel of 100. I stopped a lot to fill up my water bottles and dump water on my head. I took it slower than usual and just focused on one mile at a time. Finished with the full distance I had planned at 9:02 average pace. I don’t think I’ve ever sweat that much from a run, but oh well. I survived. Mentally and physically tough runs build us up. They’ll make race day feel like a breeze! (Hopefully. At least that’s what I tell myself). Lots of walking to do my errands plus two BBG arms & abs circuits. My legs are really sore, but I wanted to do something! Also doing lots of stretching and foam rolling. Always thankful for recovery days. These weeks of training are flying by. Can’t believe tomorrow starts week 8! Another big week ahead. And my first 20 miler is going to be here before I know it. My mileage is ramping up much faster this year than my last two training cycles, but I’m feeling good about it. I’m definitely a stronger runner now than I have been the past two years. It’s exciting to push past my limits and see myself excel. 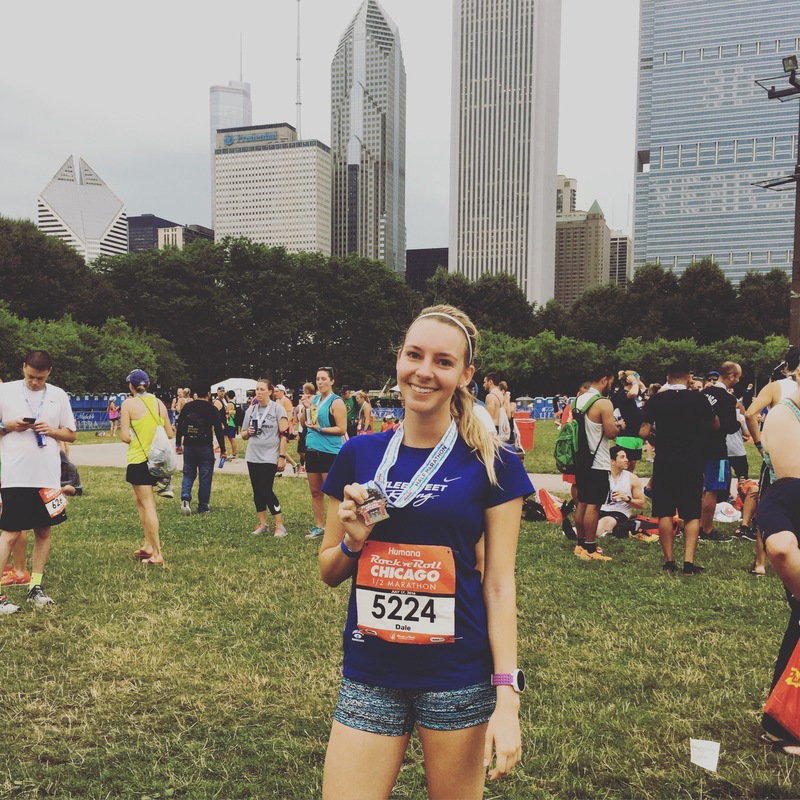 July race was the Rock N’ Roll Chicago half marathon. I was nervous to sign up for a half in July incase the weather was brutal, but it ended up being pretty perfect. It had been awhile since I’d been to a race expo, so I was pretty excited on Friday. Race expos make the anticipation of the race that much more intense. It was fun to walk through the expo, take some pictures, and check out some gear. Got me more than race ready! The 6:30 AM start was a little rough since I didn’t go to sleep until 1 AM the night before and had to leave my parents house at 5 AM to get back to the city. But I’d rather start early to beat the heat (and in today’s case, the storm). Getting into corrals was easy. I was in Corral 5, so I got to start almost right away which was really nice. I took the first two miles slower, but my third mile was a 6:42. I definitely needed to slow my roll. My GPS got messed up since the race was on the actual streets, but at least I was able to keep track of the time. I had no real time goal or intent to PR, but I felt great. I ignored my watch for the most part and just ran. The miles flew by. I felt like I kept picking up speed. And I felt strong. I crossed that finish line at 1:39:41. And I felt awesome. I wasn’t that tired, but I knew I ran well. 527th overall out of 11,000 people?! This shocks me. Pretty proud. This time was less than a minute slower than my previous PR, but I am still convinced that course was short, so I’m counting this as a PR. Three half marathons this year between 1:38 & 1:40! That gives me more confidence that I can make a BQ attempt at my marathon this fall. Unfortunately, the post race party got canceled due to a storm that rolled in shortly after we finished. 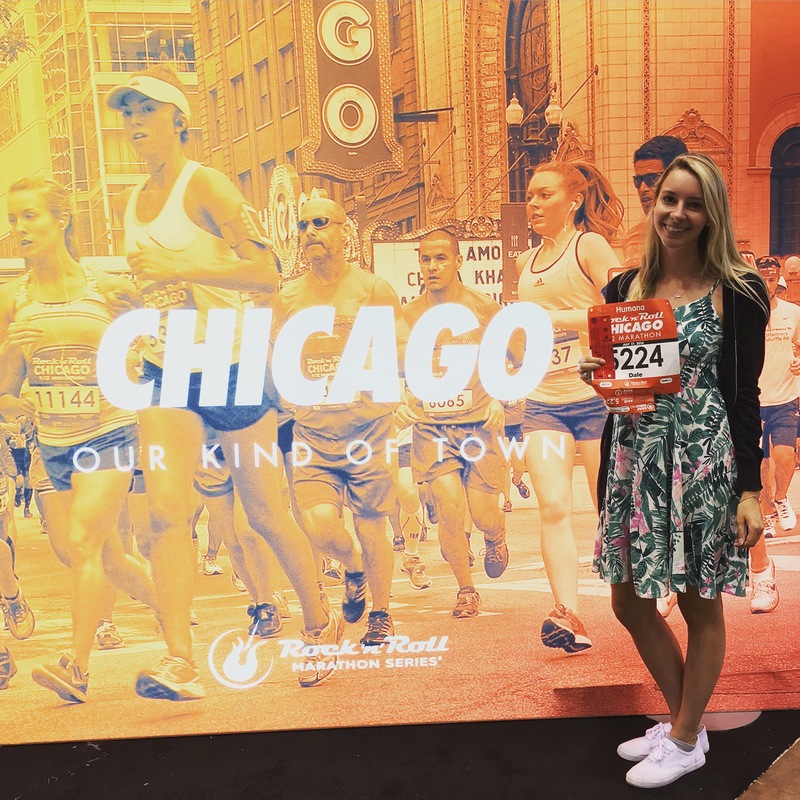 I would have loved to meet some insta runners! Next time. We were able to get a couple quick photos before the rain started. Proud of these two for strong races today! 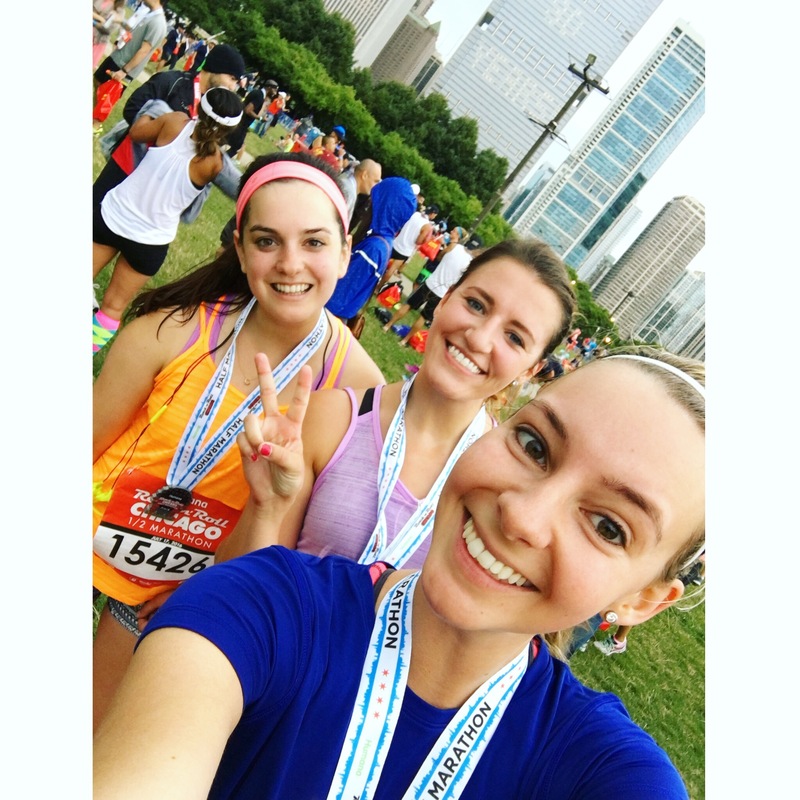 It’s so fun to have friends that take part in this crazy passion of running too. And Jen and I are officially done with 7 of our 12 races/months for 2016. Overall, a well run race. By the organization and by me (lol). I’m so glad I decided to sign up. And this race reminded me so much of the Chicago Marathon. Got me even more excited!! A race week. Still followed my plan as normal, and tried to stay super hydrated all week. Can’t believe this was already week six! Early morning progression run. Splits: 9:16, 8:53, 8:13. Great way to start the day and the week. Ran three miles after work and ended at Flywheel’s front door. 45 minute spin class that left me dripping sweat. It was a tough workout, but I felt great. 800+ calories burned for the day. Mile repeats that got cut short by a storm. Always love team speed workouts anyways. Warm up, 2 mile repeats, 2:30 jog inbetween, and a cool down. Mile 1- 7:12. Mile 2- 7:09. Happy with the workout! Scheduled rest day, but I had my hour long office yoga session I couldn’t miss. A lot of neck focus and relaxation focus. I always feel so great after yoga. Really need to do it more! Early morning 7 miler along the lake. 8:16 average pace. I ran a little faster than planned, but it just felt good to run. A little pre-race shakeout run. Sometimes it’s fun to just go out for a quick run in the sunshine. Race day! An early 6:30 AM start after only 3.5 hours of sleep, but I still ran better than expected. Official time was 1:39:41. 7:36 average pace. 527th person overall. Pretty proud. I loved every second of this race. I’ll have a a full race recap up soon! Another great week of training. Time is flying by. This race week gave me a little more confidence that I can hold a faster pace for this marathon than I thought. 12 more weeks of work to put in before I find out! Set goals. Work toward them. That’s what marathon training is for me…a series of goals. Some days the goal is just to get in the set number of miles. Other days it’s to work on getting faster. Reaching the small goals helps me work toward the big one. Each week of training is important and this one wasn’t any different. Ran four miles in the suburbs for the 4th of July. Kept my pace easy and felt good! One hour circuit training class after work followed by a 3.05 mile run with Kyle. Casual 800+ calories burned. I was so hungry after this, but felt really accomplished. I love the 500 Calorie class at Enrgi! Moved the planned speed workout to Thursday due to expected storms! And my legs were happy to rest. Met up with my racing team friends to do our weekly speed workout after work. 10 minute rep at half marathon pace with 2 minute jogs inbetween. Plus warm up and cool down. It rained SO hard during this run. We could barley see. But we kept moving. Our average pace for the 3 reps were between 7:42 and 8:22 pace. Really happy we stuck with it. 7 miles total! Early morning 7 miler at a relaxed pace (just under nine minute pace). The best way to start the day! A long run that took two attempts. 1.65 miles in the morning until I decided running without my orthotics was a bad idea. Came back to the city and tried again in the evening. Got in my planned 14 miles! I ran along the lake, listened to a couple podcasts, and enjoyed the solidarity. 8:45 average pace and I felt great! Woke up and went to Studio Three for a Torch class. One hour of strength, rowing, and running intervals. 1.75 miles run during class. Great start to the day! Really happy with this week. I nailed all my workouts and felt strong. Needed this week! This week was a bit of a tough week. I was feeling so drained and out of it for most of it. I still got all my miles in, but I did switch things around a bit and took an unplanned rest day. Now this is how you start off a week. I went to a 6 AM spin class with my work wife and followed it up with a three mile run. The class is 45 minutes and I typically burn about 500 calories. I kept the run at an easy pace since it was directly after class, but my legs did okay. I felt super ready to take on the week! I had to fly to Cincinnati for work this day. I woke up with enough time to run, but traffic to the airport was bad and I got nervous so I skipped my run. I got home at about 10 PM, so it was a rest day. Moved today’s run to Thursday. I did this speed workout on my own. 800 meter reps x 6. 90 second slow jog in- between reps. With warm up and cool down it totaled 8.15 miles. I was super consistent with my paces, which surprised me. My reps were all at around 7:10-7:30 average pace and I gradually got a little faster with each rep. Proud of this workout! The speed workouts are always tough, but always worth it. Easy three miler in the morning. I always love starting my day with a run, even when it’s hard to get out of bed. I accidentally turned off my alarm, so I didn’t have time for the full 6 miles on my plan, but I made the most of the time I did had. 4.15 miles is always better than nothing! Unplanned rest day. In all honesty I drank too much on Friday and couldn’t convince myself to run in the morning. I felt awful. And it was kind of a wake up call for me. I can’t take my body for granted. I can’t go out and drink like I did in college and expect to be able to run the next day. I’m taking a serious break from alcohol and not letting it ruin my training. I’ve got too big of goals to let myself down. Made up for lack of exercise on Saturday with my Sunday. 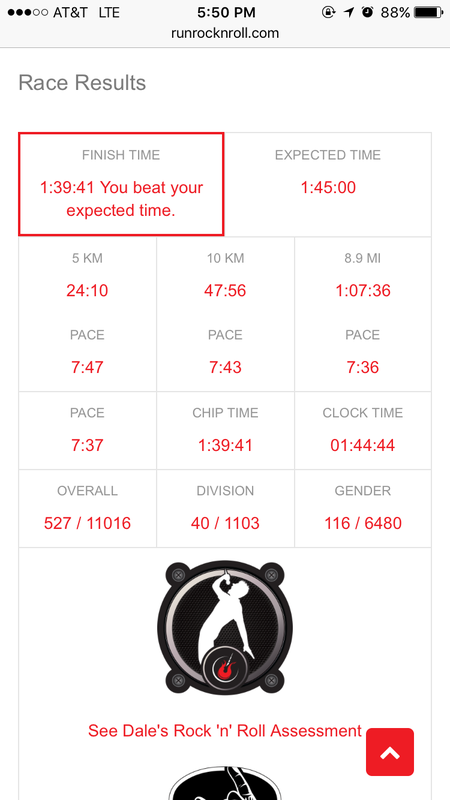 I ran a solo half marathon in 1 hour and 55 minutes. 8:46 average pace. I felt okay. Not great. But I enjoyed running in the suburbs and having some reflecting alone time. Then I went on an 8 mile bike ride with my boyfriend. It was a beautiful day and I just wanted to be outside. Thankful to have an active day. I’m glad I got my miles in, as well as some cross training. It wasn’t as great of a week as I had wanted, but I have 14 more weeks to really focus on my training. I’m ready to take better care of my body and fuel it the best way I can to perform to the best of my ability on all of my runs. I love to run and I don’t want to do anything to make it harder on myself. Here’s to a better week 5!